Teeth whitening has become a very popular dental procedure for people of all ages. People know that having white teeth can change people’s appearance greatly and it can also provide a quick way to bring back some youthful glow to your appearance without going through too many extremely invasive cosmetic procedures. Whitening products over the counter (ie whitening toothpaste, strips, gels) are low in concentration in terms of bleach and it could take a long time before you see any results. To ensure safely and a predictable outcome, we recommend clients to have their whitening treatment done at our dental surgery. We first take impressions of your teeth and from those we make snug fitting bleaching trays that fit in your mouth perfectly. You then place small droplets of bleaching gels into those trays before inserting them in your mouth. The take home kit will take a few hours a day for a maximum of 14 days. Want us to do all the work instead? With the in-chair Zoom! whitening method we look after the entire teeth whitening process for you at the comfort of our surgery. First the dentist will apply a protective barrier over your gums and lips. Then bleaching gel will be coated onto your teeth. We then place the Zoom! 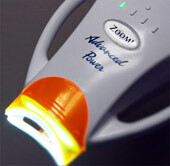 Advanced Power Whitening light over your teeth to activate the whitening gel. This procedure usually takes about two hours from start to finish. Before commencing any teeth whitening procedure, it is important to have a thorough dental check-up to ensure any cavities, disease of the gums or exposed roots are taken care of prior to teeth whitening. During this appointment we will go through both of the above treatment thoroughly so that all our clients have sufficient understanding of both procedures before making their choice. With both of the above methods, you may experience some levels of sensitivity during or after the treatment. Sensitivity can vary from client to client some have reported no discomfort while others have found the above procedures a little unpleasant to bare. Sensitivity can be reduced by using regular pain killers after the treatment such as panadol or nurofen.